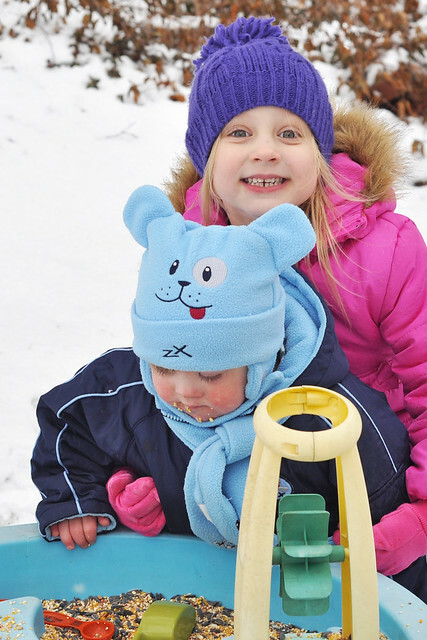 The winter weather is upon us, which means cabin fever is rapidly setting in! Anyone who has kids knows this isn't a good thing. Being trapped indoors with four bored children is NOT my idea of fun! I reached the point of desperation this afternoon while watching Lily and Liam race through the house. We HAD to go outside before we all went crazy! Liam is not a fan of the cold (as in anything below 50), so I had to get creative and find something that would keep his mind off the temperature. I really can't blame him. 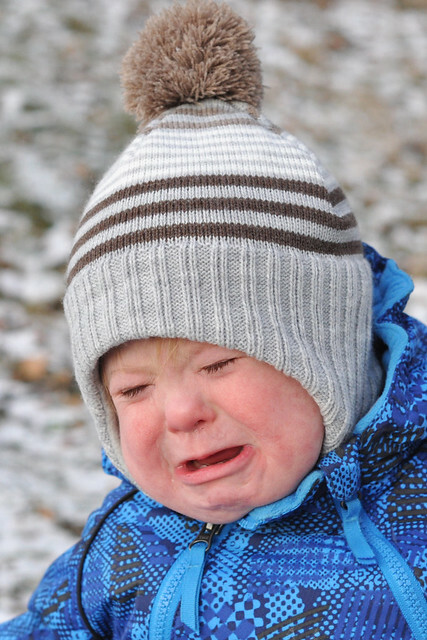 His typical reaction to the cold is the same as mine. 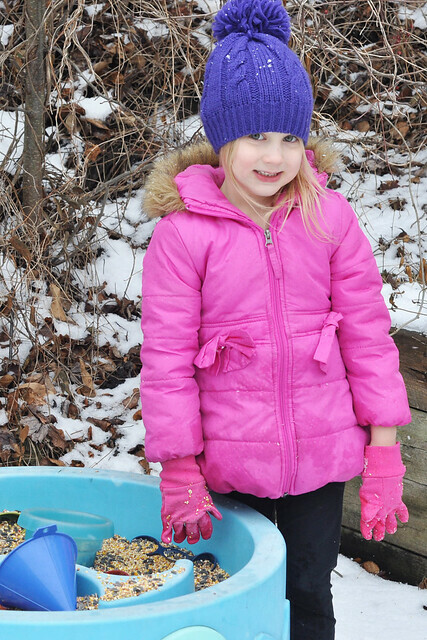 I scanned my trusty list of activities for kids, and settled on one of Lily's favorite winter activities. 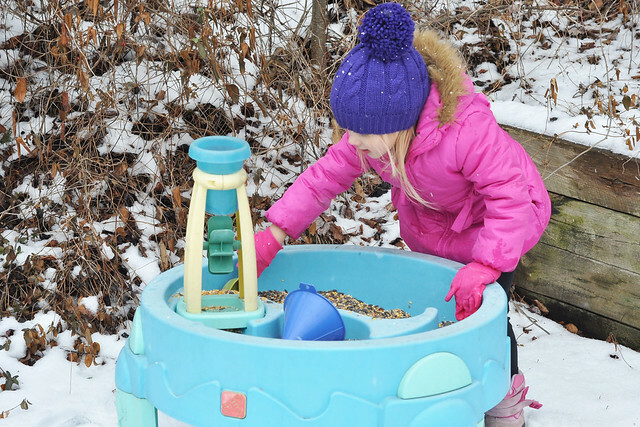 It involves our water table, a 10 pound bag of wild bird seed, some scoops and funnels, and bird seed thrown all over the backyard! 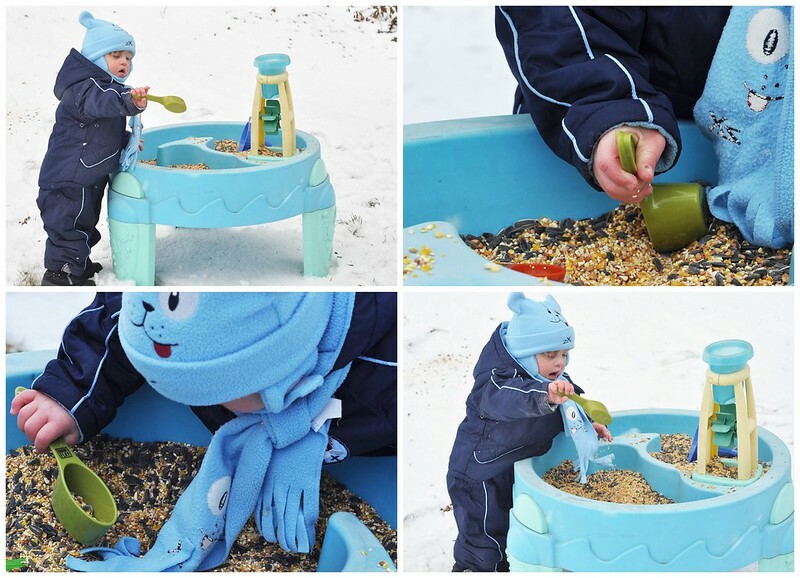 The concept for the Seeds and Scoops Sensory Table is really simple and inexpensive. 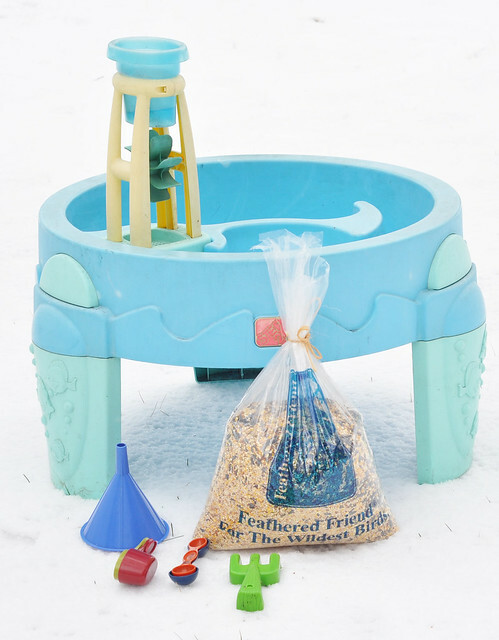 Clean out that water table, collect some kitchen utensils, and buy a cheap bag of wild bird seed that will last for weeks! Water tables are NOT just for water! 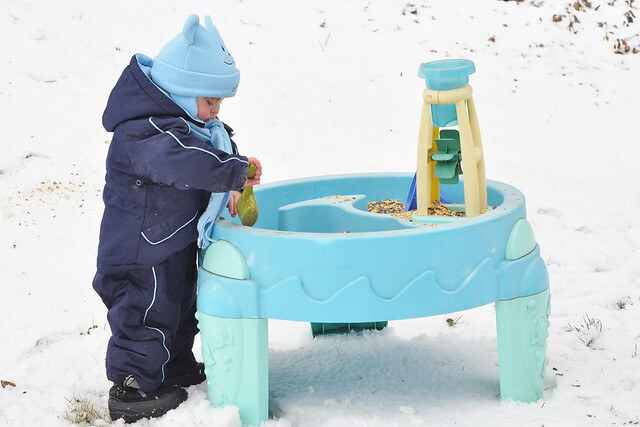 We use ours for sensory play year-round. The BEST part of this activity is that the mess makes everyone happy! The kids don't have to worry about being neat, the wild birds are extremely grateful, and I don't have to clean up the mess because the birds do it for me! It's a win-win situation for everyone involved! 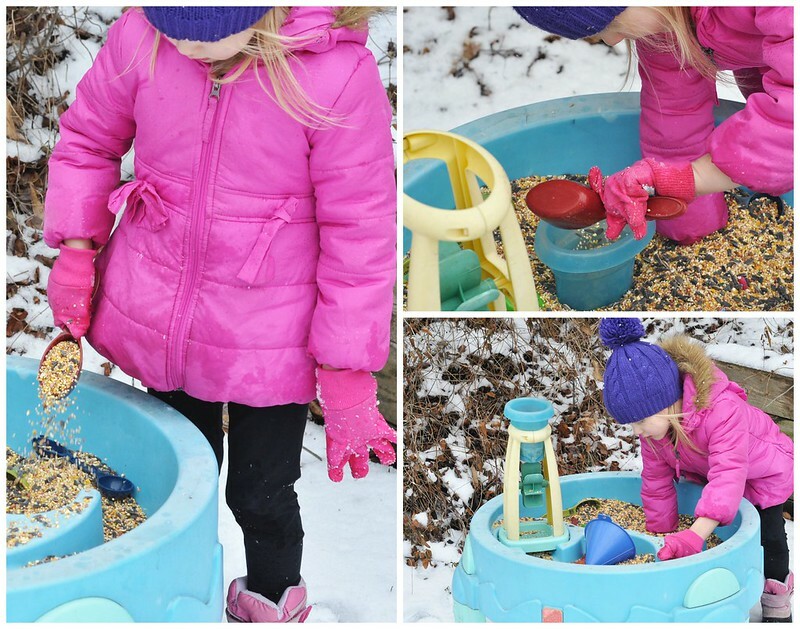 Lily was so excited to "feed the birds" so she immediately dug in. After initially squealing about the 35 degree weather, Liam spotted the table and rushed over. 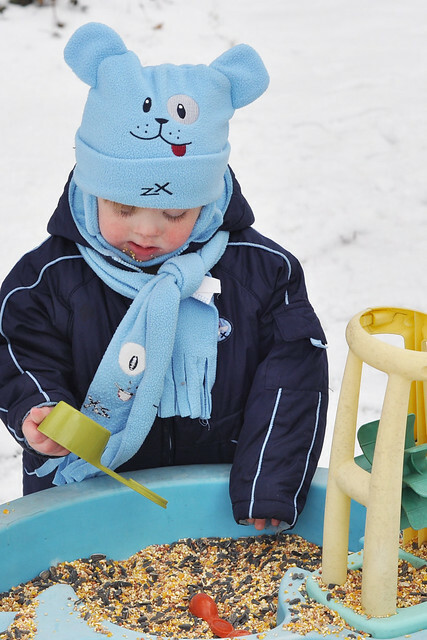 Although Lily (and my older kids) have done this many times, Liam was too young last winter. It definitely captured his attention! Lily ran back and forth, but for 25 glorious minutes, Liam scooped and poured and touched and tasted (he decided it wasn't very tasty). When they were done playing, bird seed was scattered all around the table. 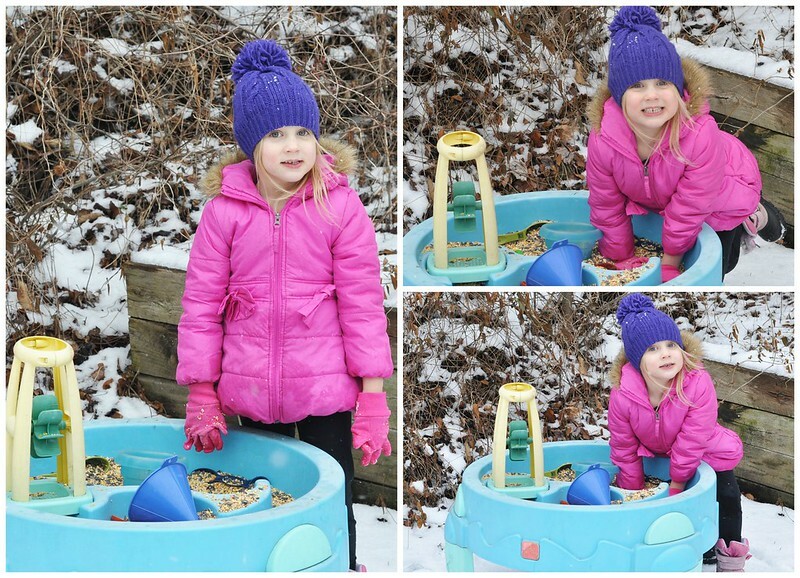 Just like she did last year, my sweet Lily still had to take the time to feed the birds just a bit more! Our backyard birds are very grateful! 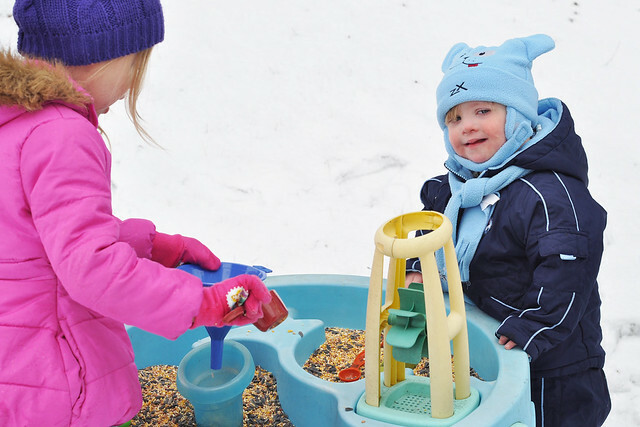 Lily loves to scoop the seeds and feed the birds, and it was a hit with Liam, too. I am constantly looking for ways to engage him from a therapy standpoint, and this was a great activity for him! Later, we were able to watch the birds clean up the mess from our kitchen table! 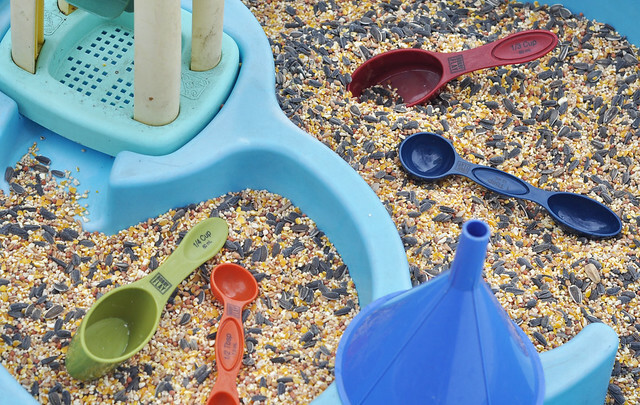 The Seeds and Scoops Sensory Table is a fun sensory activity that helps build essential OT skills, plus it attracts those backyard birds. 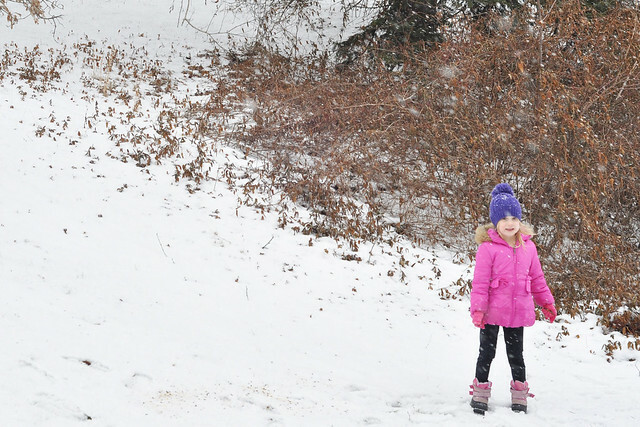 It's perfect for outdoor play in the winter AND it's a great boredom buster! 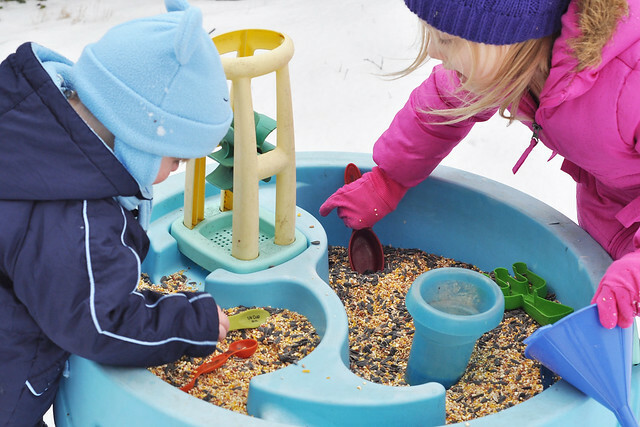 Are your children into sensory play or do you shy away from the mess? *I'm linking up with Grammie Time for Party at My Place and Holly for While I'm Waiting. How fun! I am so jealous that you guys have snow. We didn't get much of a winter at all. Boo! And I'm completely jealous of your warm weather!!! We could swap for a while! 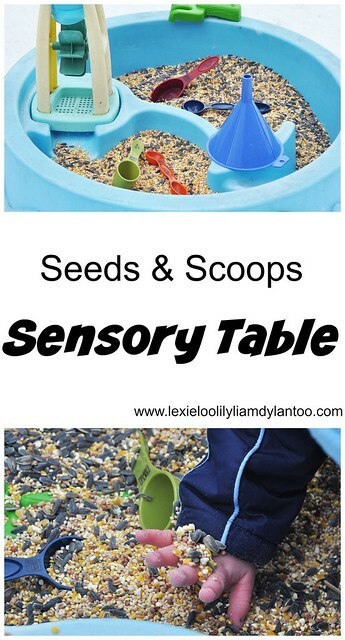 This may be the best sensory table activity I've seen yet! 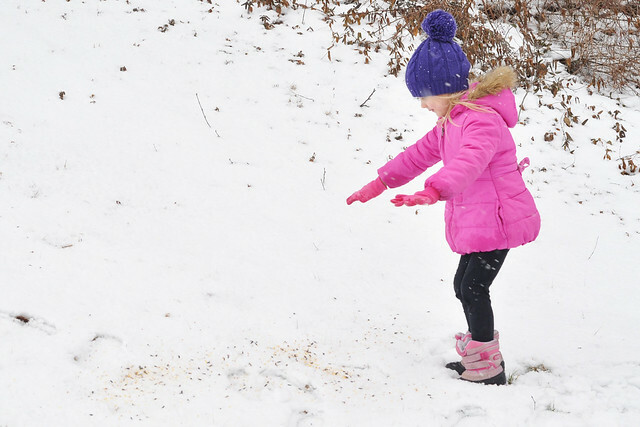 I love that the mess feeds the birds! Thank you so much! I love the easy cleanup! Thank you, Annette! It makes me cry, too! Haha! What a great idea. Love this. Going to share this with our two year old teachers at my school. They are always looking for ideas to do with the little ones outside. 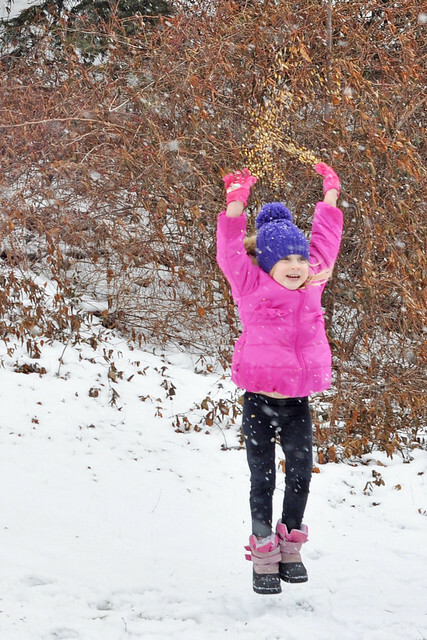 I bet your kiddo had a blast. I once did beans outside for my grandkids in a big Rubbermaid bin since I didn't have a sensory table. Of course they were scattered everywhere. A couple weeks later after the mess was cleaned up, I looked outside on my patio and on the edge were little bean sprouts coming up in the grass. I thought where did they come from and then remembered the beans in the bin. My husband wasn't too happy with all the time he puts into the lawn, but I thought it was amusing. Thanks for sharing this idea at Party at My Place. That is a funny story! 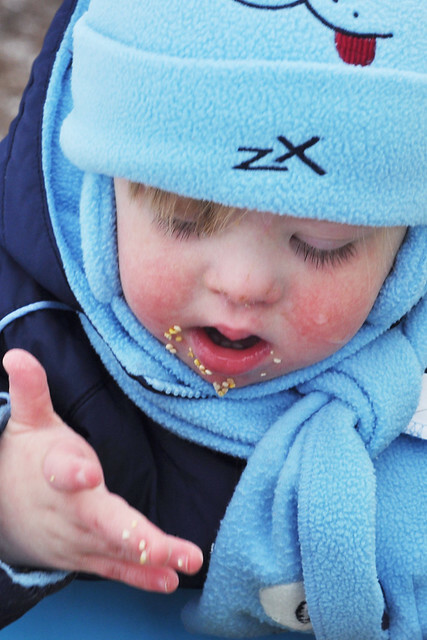 My kids played with a bean sensory bin before, but it was indoors. I will have to remember not to take it outside! I enjoyed linking up this week. I hope you're having a great weekend!